Kurdish hospitality isn't a myth, by the way. Karwan, our private tour guide, invited us to his home for a traditional Kurdish dinner, dolma. His wife, Pakhshan, sure knows how to cook – it was delicious! 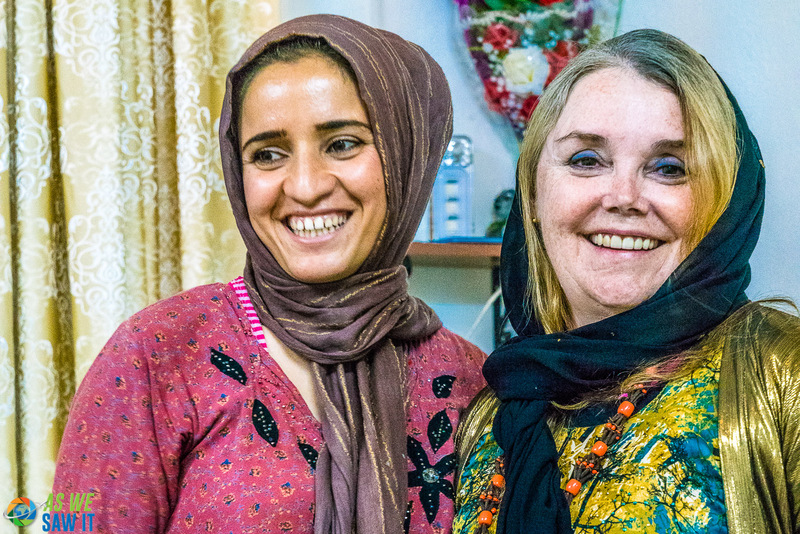 After some traditional Kurdish tea to round out the meal, she took Linda to her room and dressed her in traditional Kurdish costume. 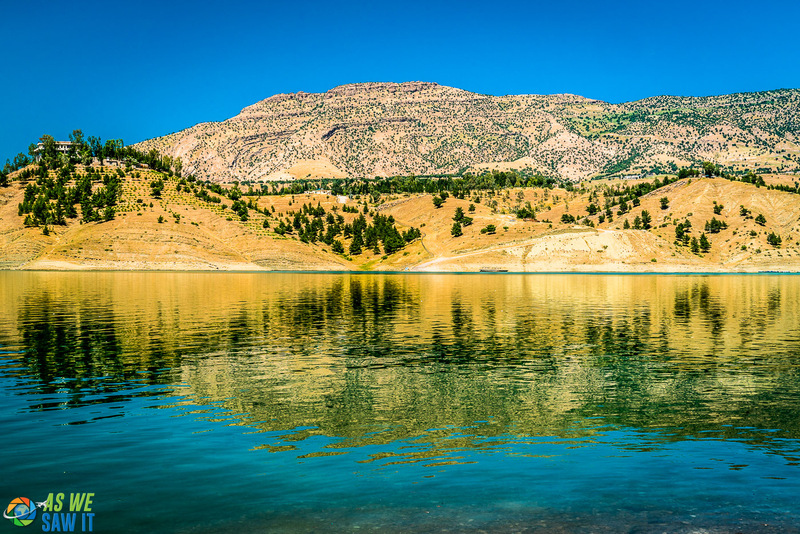 More than 40 different types of fish can be found in the lakes and rivers around Iraqi Kurdistan. This restaurant prepares its most popular dish outside. 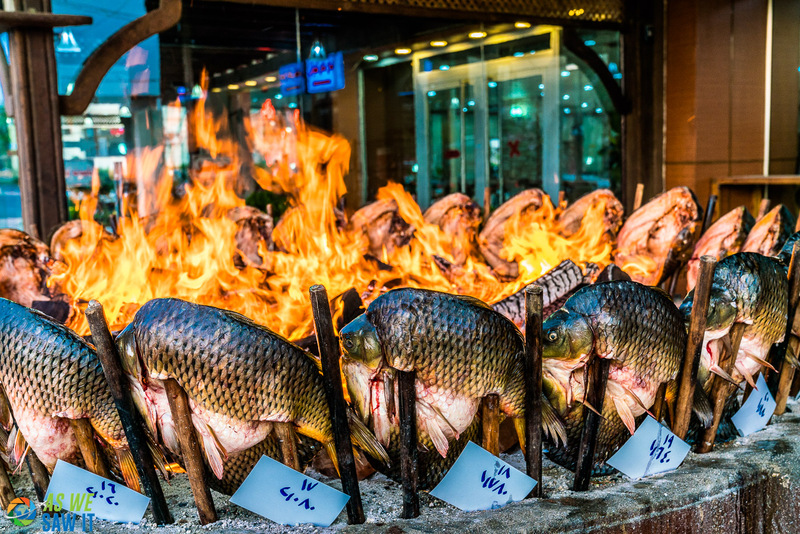 Here, the fish are split and surround a huge, open fire pit. It is such a family favorite that you have to order your fish ahead of time. The labels track which fish belongs to which patron, so you get what you paid for. Fact: Modern Kurdish derives from an Iranian (Persian) language. You'll also find this influence in their foods. Erbil is both an Iraqi governorate (state) and a city. 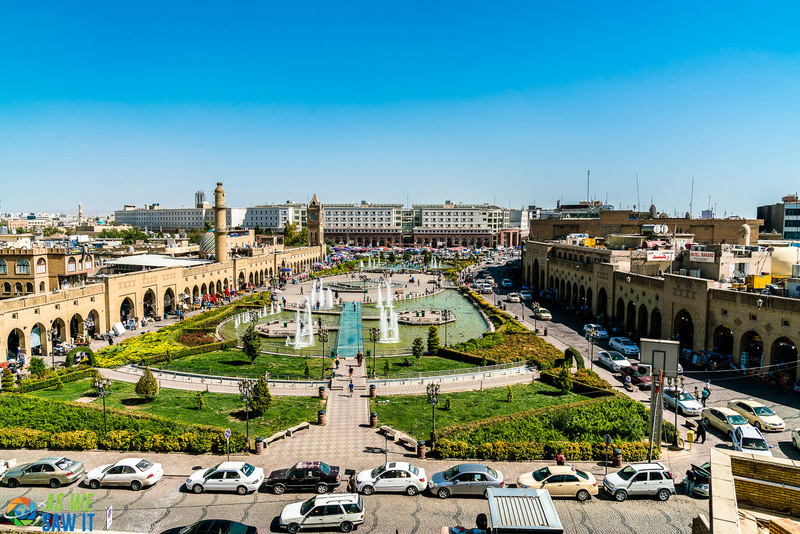 Erbil city is the capital of the Iraqi state and the center of government for the autonomous Kurdistan region. Assyrian texts refer to the city as Urbilim, Arbela and Arba-ilu. If that doesn't confuse you enough, we saw road signs spelling it Erbil, Arbil and Irbil. 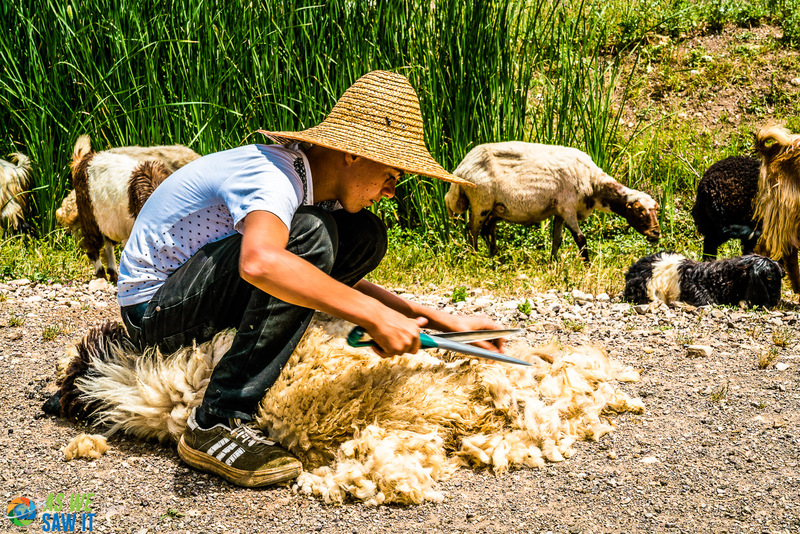 The locals just ignore all that and call it Hewler. Fact: While it's possible to drive into Kurdistan from many directions, the only international airport is Erbil International Airport (EBL). 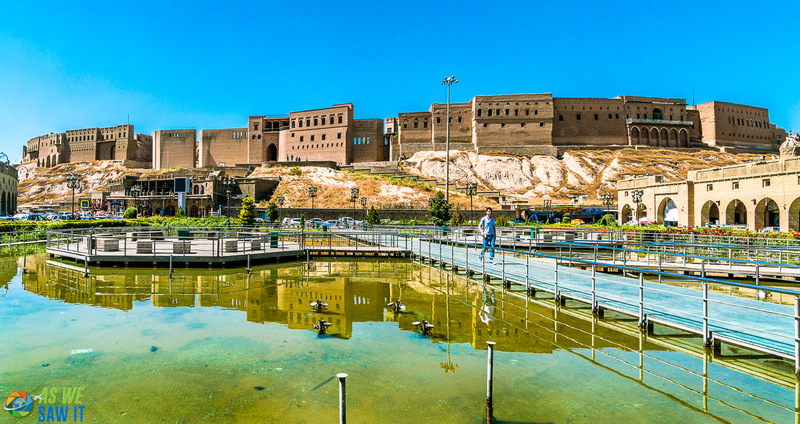 Standing at the center of the city is the massive Erbil Citadel, which has been occupied for 5,000 years. This makes it one of the longest continual human settlements in the world. It is now a UNESCO world heritage site. Karwan calls Jalil Kkayat Mosque “the beautiful mosque.” Spot on. Even non-Muslims like us can appreciate the exquisite beauty of its highly polished floors, carefully laid brickwork and intricate tilework. 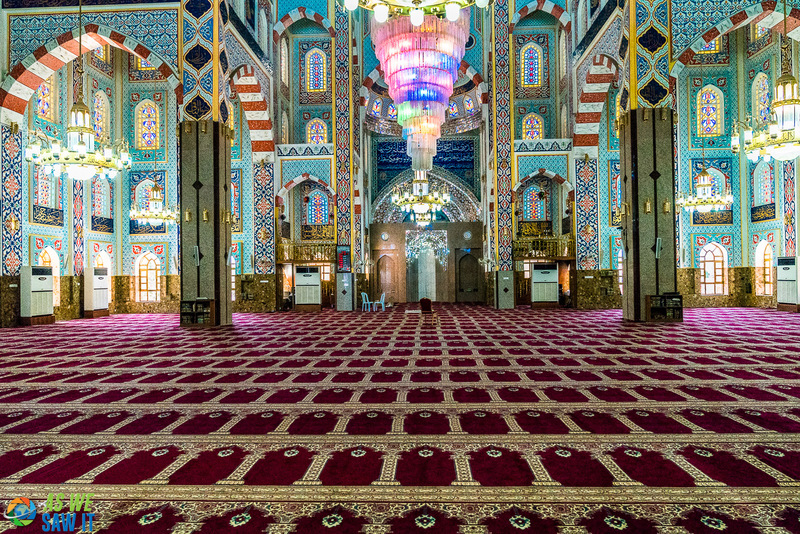 Inside, it may look like mosaic, but it's not: The walls and ceiling are decorated with colorful Zakhrafa (a type of Islamic painting), scripts of assorted verses from the Quran, luminnous stained glass windows, and huge, crystal ceiling lamps. Kurds like to picnic, so it's no wonder that Minare Park is a popular destination near the city center. It can get pretty busy, especially in the cool evening air of summertime or during a concert at the amphitheater. 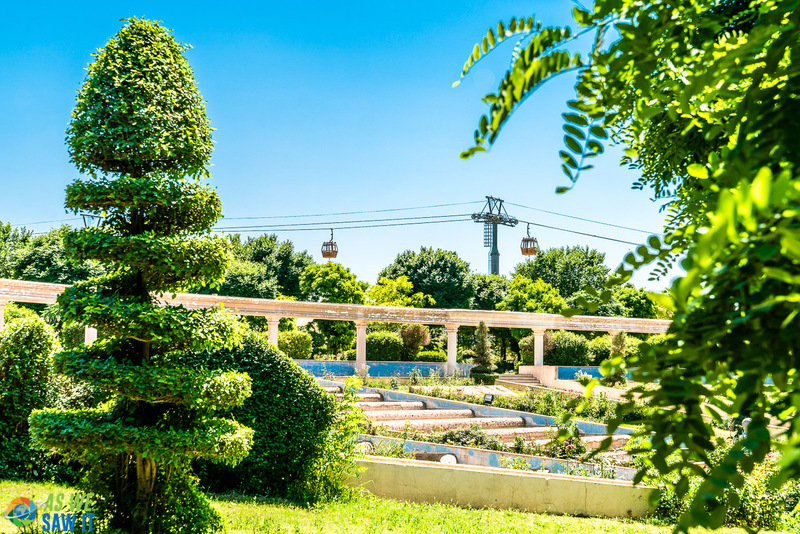 The park also offers flower-filled gardens, a cable car, playgrounds, statue-filled walkways and a terrace cafe for refreshments and hookah pipes. Minare Park gets its name from an ornate, brick minaret on its grounds. Built in the 13th-century (around the time of Saladin), it's the only thing besides the citadel that remains from ancient history. 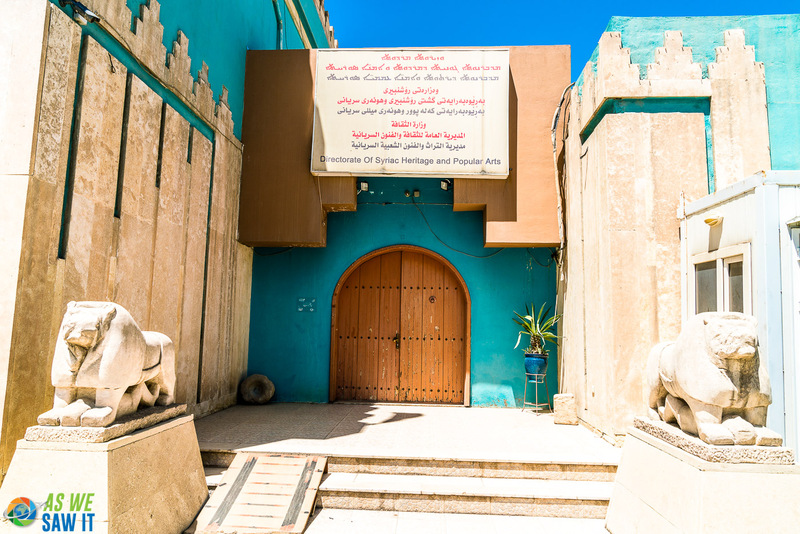 The Syriac Heritage Museum, in the Christian suburb to the north called Ainkawa, is worth a visit, even if you're not normally a museum-goer. They have a good collection of folk art and artifacts, as well as an extended collection of pictures and personal objects. Most impressive was a diorama that was created by hand by the museum's director. 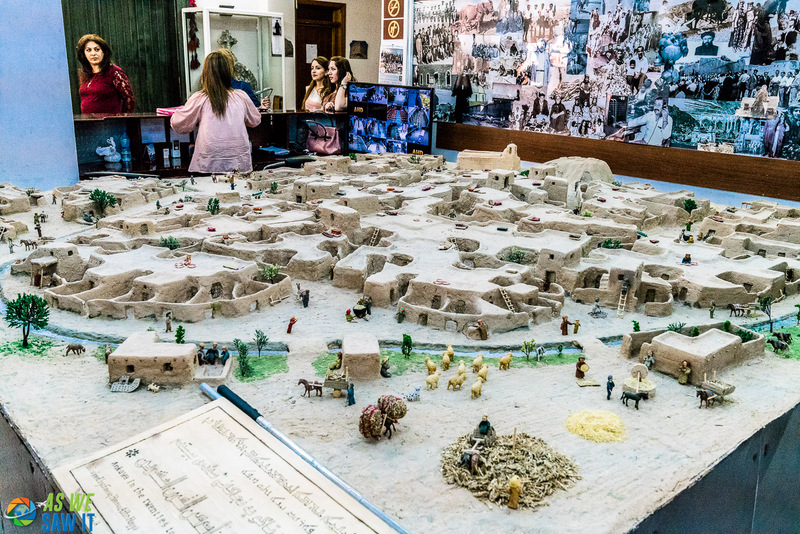 It is a fantastic model of Ainkawa from only decades ago, before the suburb was modernized. Dohuk, which means Yazidi village, is another governate in Iraqi Kurdistan, as well as the name of the capital city. 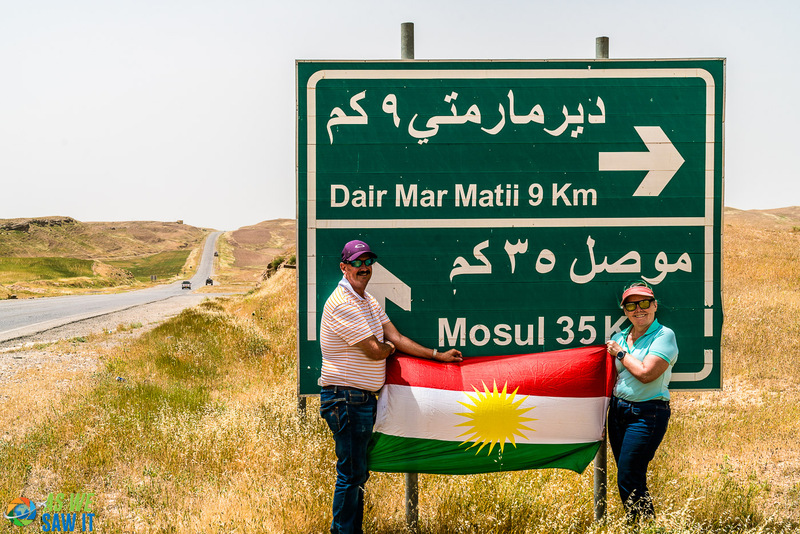 The city of Dohuk is surrounded by mountains, huddled along the Tigris river, and has a thriving tourism business from nearby Turkey and Iran, The city itself is mostly Kurdish, with a smaller population of Assyrian Christians. The population fluctuates greatly depending on violence in the region (1.4 million in 2015). However, since the liberation of Mosul and removal of ISIS in June 2017, many refugees have been moving home to neighboring Nineveh Governorate. History lovers that we are, Karwan brought us to see some Assyrian carvings, weathered after three thousand years. We drove into the Gara Mountains to visit one of Saddam's 80 palaces. Yes, you read that right. Like the others, not much remains of it. Is it any wonder, after Saddam's calculated Kurdish extermination campaign? The Kurds looted what they could, destroyed what was left, and mounted a huge Kurdish flag on the rooftop. 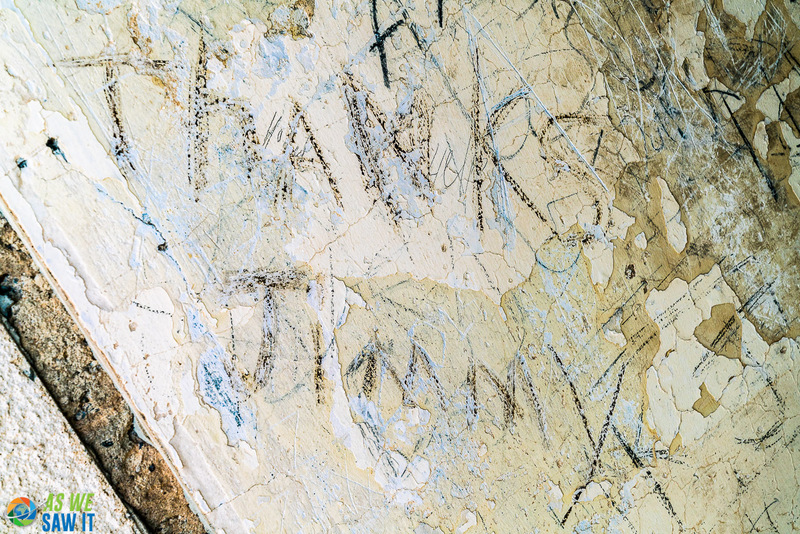 Inside, the floors are littered with rubble from the walls and ceilings, now bullet-ridden and decorated with angry scribblings. In honor of our son and others who have paid the ultimate price, I added a bit of my own bit of graffiti to what was already there. But not all is destruction and ruin. 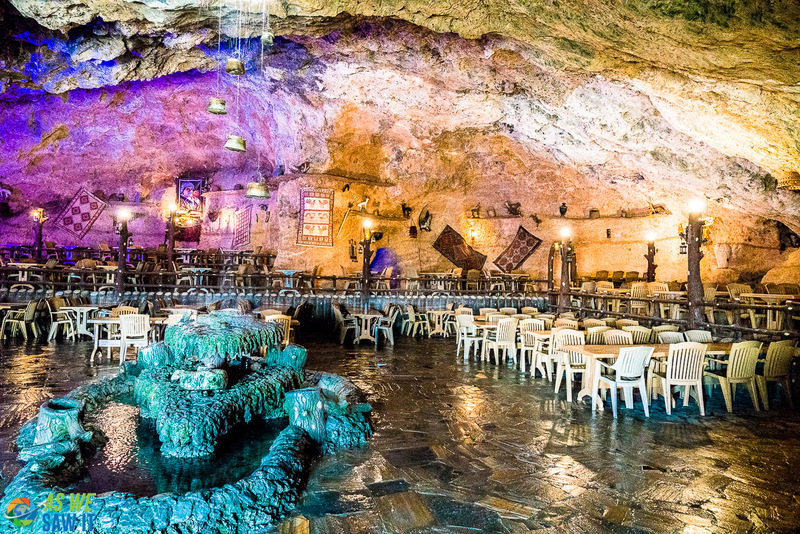 The nearby Inishke Cave, once home to Neanderthals, is now home to a wonderful restaurant. You can have lunch there, if you wish, and enjoy the food, view, and adjacent waterpark. From the restaurant, we headed to the ancient city of Amadiya (Amedi in Arabic). 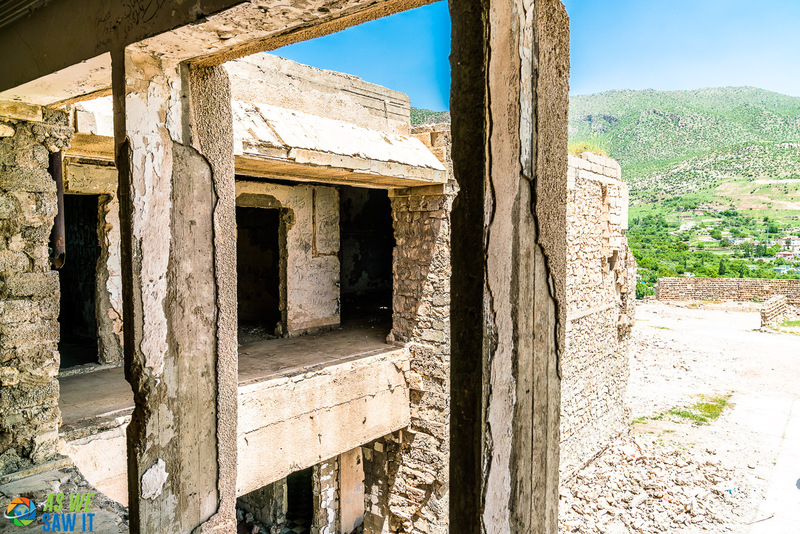 The city, an hour or so northeast of Dohuk, is perched on the flat top of a mountain and dates back to 2500 BC, when it was part of ancient Assyria. Back then, the only way to get up there was by a narrow stairway cut into the cliffside. Coupled a clear view of the surrounding landscape and a natural spring, this made Amedi an almost impenetrable fortress. Many historians believe that Amedi was where Assyria's high priests were based. These were the Magi of the Gospels, those distinguished foreigners who visited Jesus as a young child, bearing gifts of gold, frankincense and myrrh. Until Mosul was occupied by ISIS, Nineveh was best known from the biblical tale of the prophet Jonah, swallowed by a giant fish because he refused to warn an Assyrian city to repent. Its capital, Mosul, is across the Tigris river from what remains of ancient Nineveh. Only 50 km from Mosul, Alqosh one of the few Iraqi towns that is not Muslim. 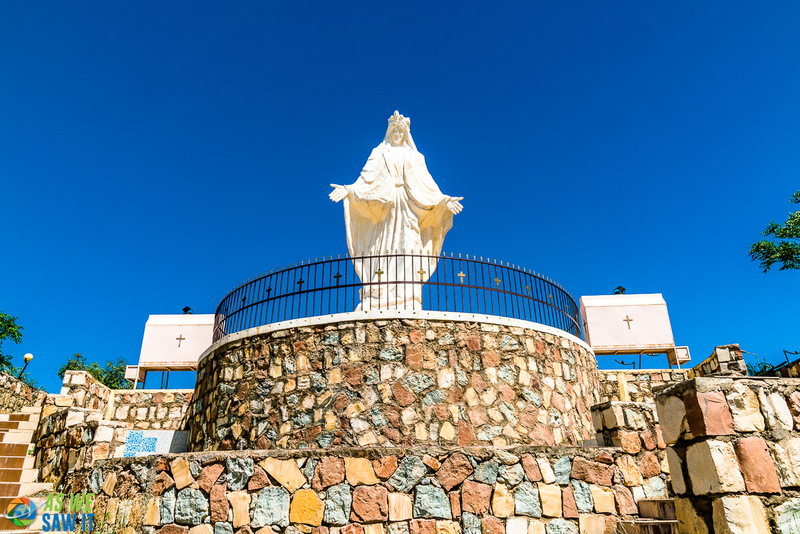 It is actually one of the oldest continuous Christian communities in existence. 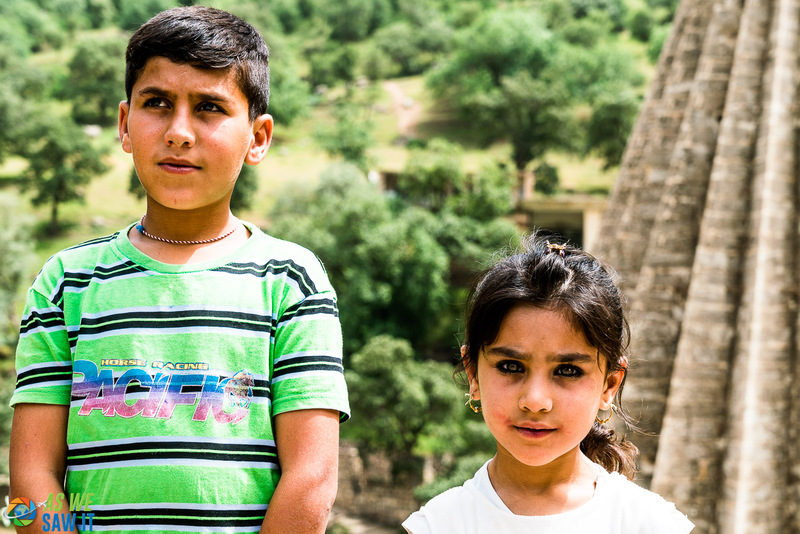 Even more ingriguing, Alqosh is one of only a few places on earth where people still speak Aramaic, the language of Jesus. 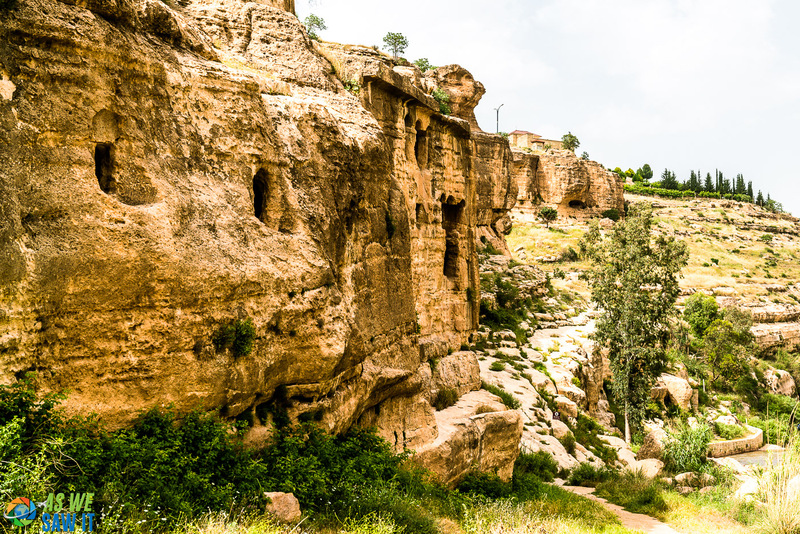 We visited Alqosh because of our interest in Biblical archaeology. Have you ever heard of the Babylonian Exile? Ancient biblical texts record that the northern tribes of Israel were exiled to Kurdistan. However, the Kurds lived peacefully with their descendants, but then Israel became a state and the remnant emigrated. Now, only buildings and tombs remain. 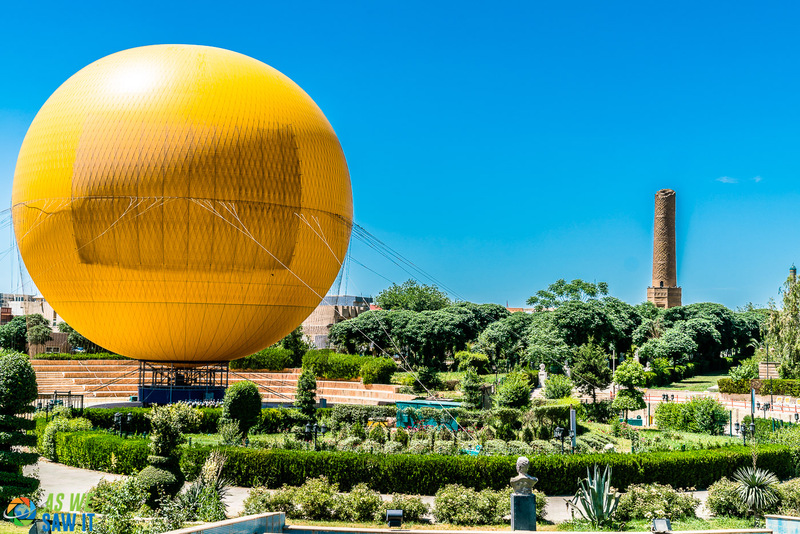 The town has a rich Hebrew heritage, and the Biblical prophet Nahum was buried here. 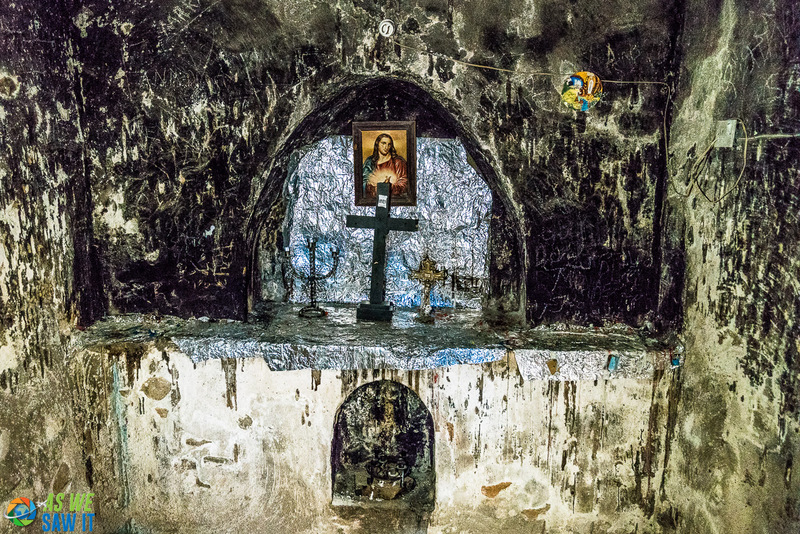 Sadly, since the Jews left, the synagogue and tomb are crumbling, and the Chaldean Christians who watch over it aren't sure what its fate will be. So if you want to go, you should probably visit soon. 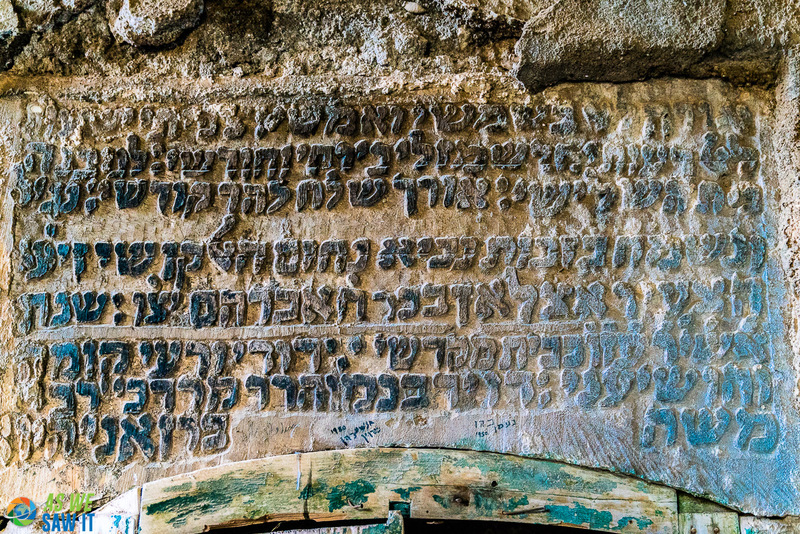 Nahum's tomb shows the presence of the Israelites; Hebrew writings remain on the walls. 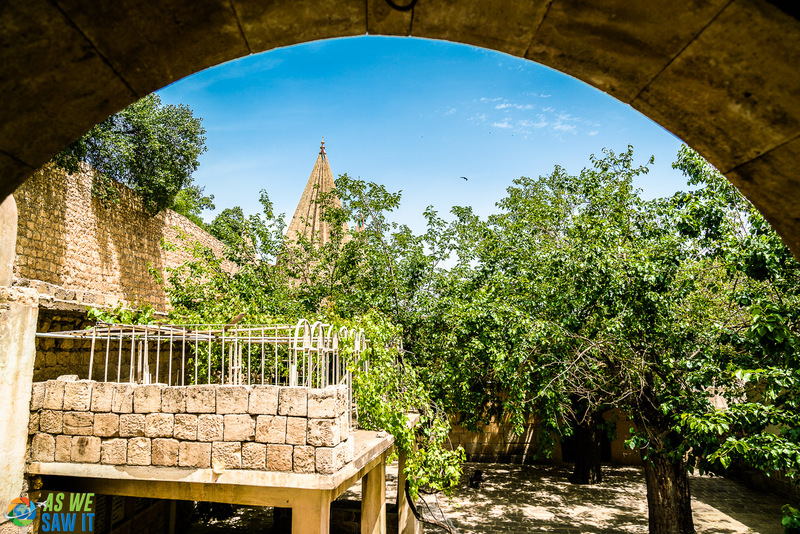 The picturesque village of Lalish is over 4,000 years old and is the holiest site of the Yazidi faith. Because of this, no shoes are allowed to be worn within its walls. Lalish is also a place of pilgrimage, where those of the Yazidi faith are expected to make a six-day visit once in their lifetime. Archaeologists and historians testify that is was once part of Sumerian and other ancient Mesopotamian civilizations. 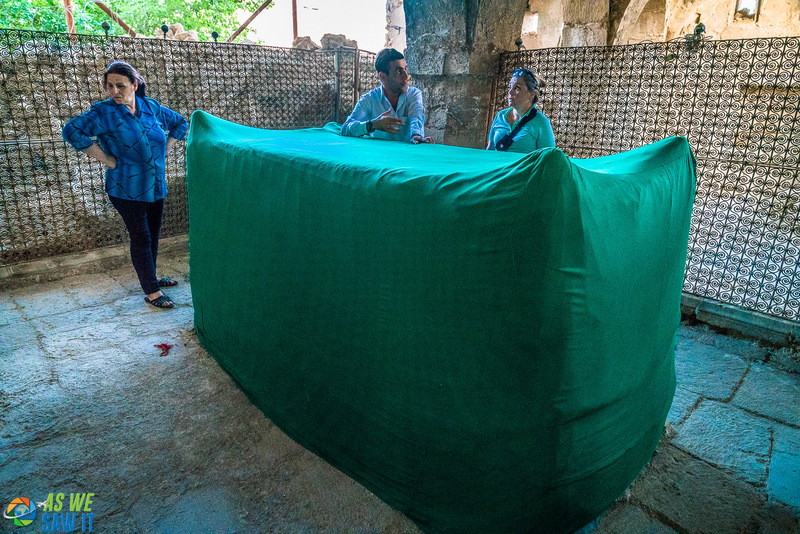 The two sacred springs in the temple, called Zam-zam, are a part of their religious practice and non-Yazidis are not permitted to visit them. Every time I see this picture, my heart breaks for the Yazidi families who have lost their daughters to ISIS. Yet I rejoice for those whose girls are safe. 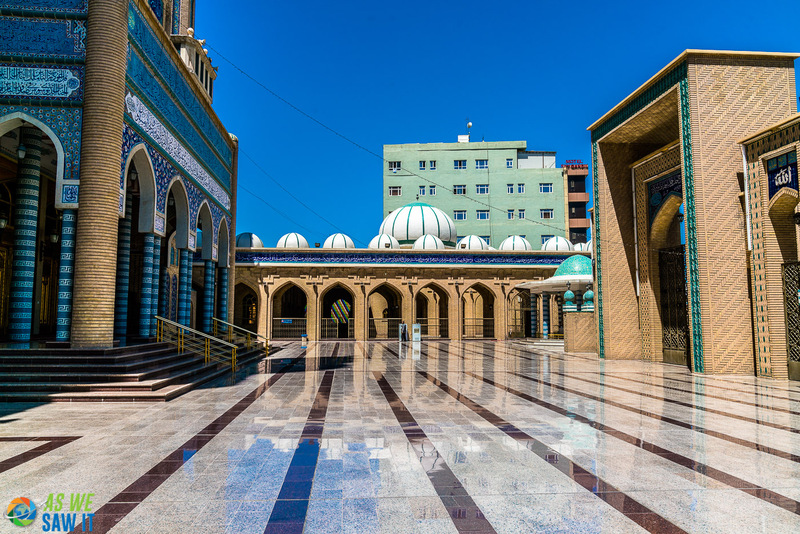 Sulaymaniyah Governorate shares a long border with Iran, as well as much of their culture. It is a very mountainous region, with towering mountains, crystal clear lakes, and thundering waterfalls. This is a place where traditional Kurdish culture abounds. 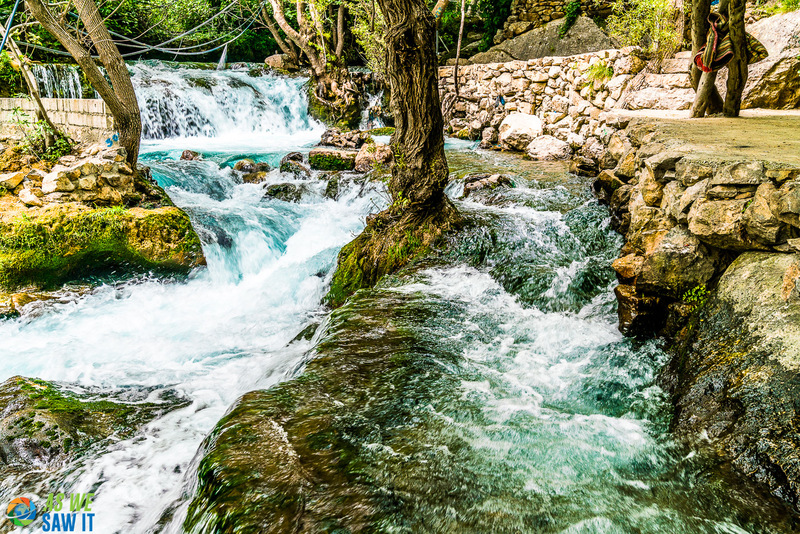 Up in the mountains near the Iranian border, the Zallim River flows down the mountain and its beautiful waterfall has become a tourist attraction. We passed a nice collection of shops and restaurants, and when we grew thirsty, the merchant pulled our drinks from the ice-cold water he had diverted into his shop. Very eco-friendly! 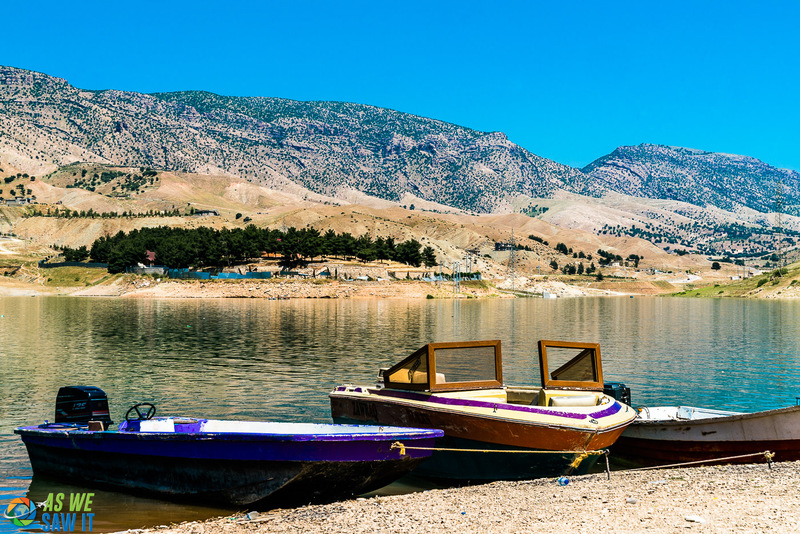 Surrounded by golden hills, Dukan Lake is the largest man-made lake in Iraq. It's also become a summer destination because of the excellent fishing, boating and swimming. There is also a lakeside resort, with cabins, restaurants, and other tourist facilities. 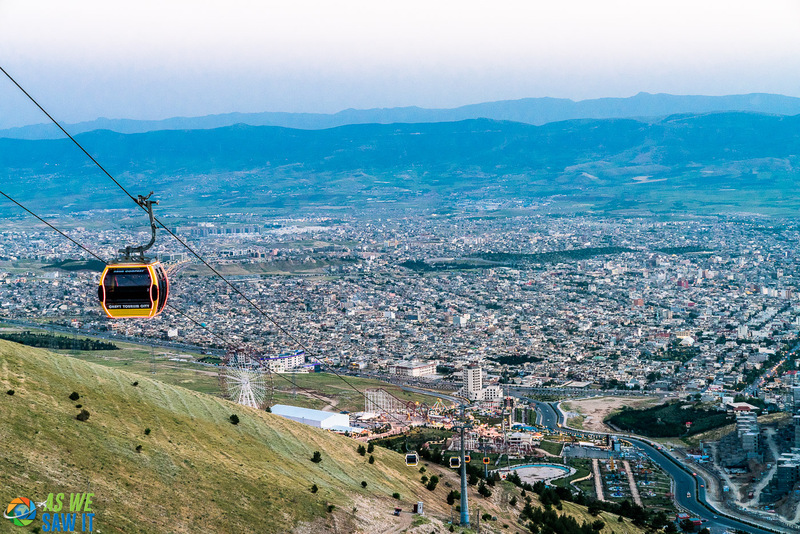 The modern city of Sulaymaniyah itself, completely surrounded by various mountain ranges, was founded over 300 years ago by a Kurdish prince named Ibrahim Pasha Baban. 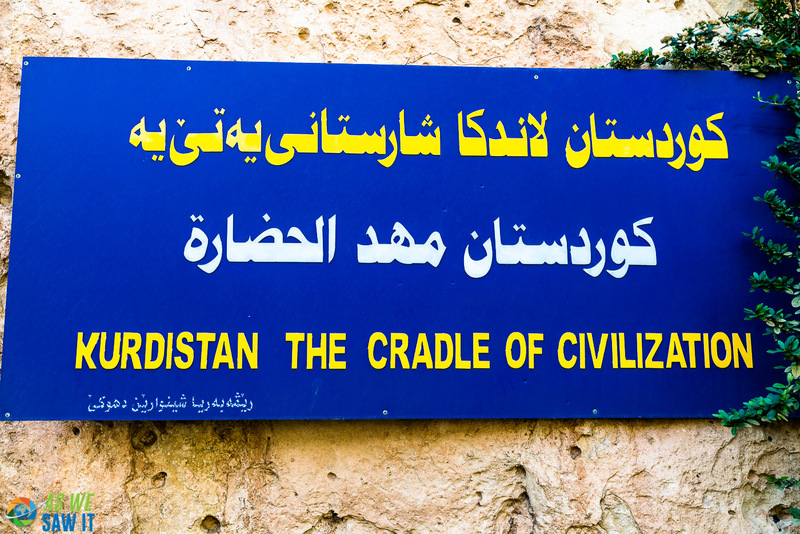 It has always been a center of Kurdish arts and scholarship and is the second-largest city in Kurdistan. The Kurds have an adage: “The Kurds have no friends but the mountains,” and Sulaymainyah is where you will fully understand how true that saying really is. 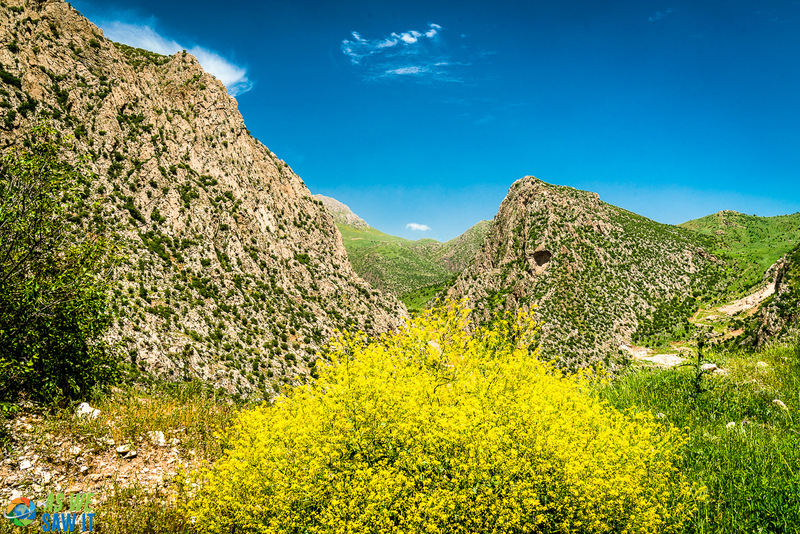 With all its beauty, Kurdistan has also experienced more than its share of ugliness. Our visit began with a walk through a long, mirrored hallway. The passageway continues for a long distance around the corner. 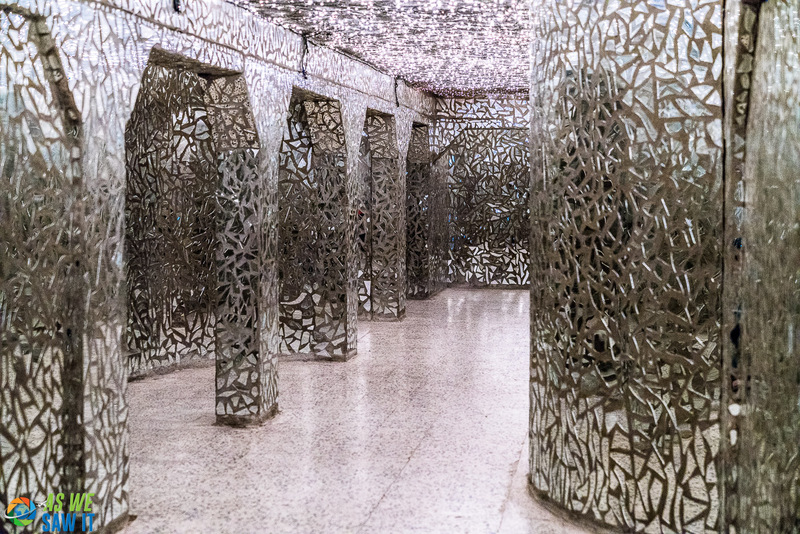 Each mirror shard represents one person who lost his life in this hell hole. Formerly a part of Sulaymaniyah, Halabja became the fourth Kurdish governorate in 2014. Halabja city earned worldwide attention when, on March 16, 1988. Saddam launched a chemical attack on Halabja, killing as many as 5,000 civilians and injuring up to 10,000 more. This was not the first time he had tried to eliminate the Kurds, so most of the Kurds fled into the mountains and neighboring countries, seeking protection from his cruelty. 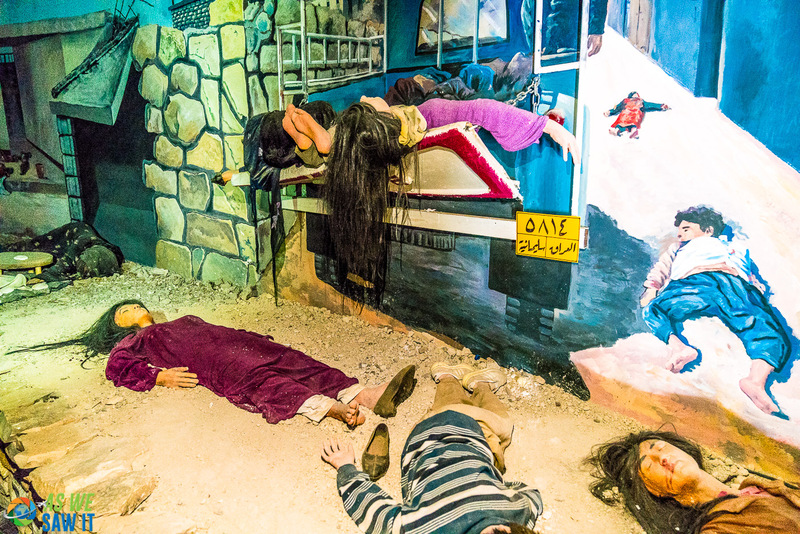 Halabja now has to a museum dedicated to the memory of the victims, with graphic photographs, dioramas, exhibits and films of the horror the Kurds have endured. As horrific as the displays might be, it is an important piece of history that should not be missed. 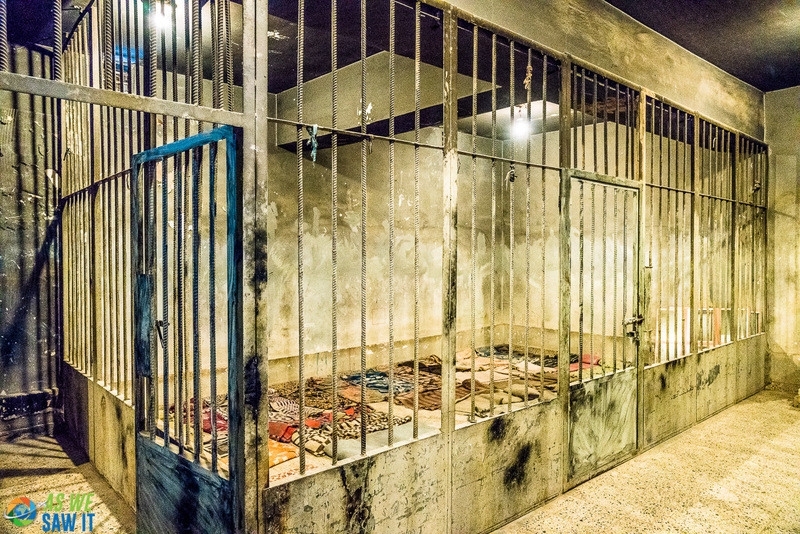 The displays were recreated photos taken immediately after one of the chemical attacks. I saw this gentleman sitting in the market and had to photograph him. Judging from his intense expression and piercing eyes. I can't help but imagine that he must have experienced so much in his lifetime. Kirkuk is a disputed territory along the nebulous border between Iraq and Kurdistan. Archeologists believe Kirkuk to be one of the earliest settled places, based upon findings in the Shanidar Cave area. 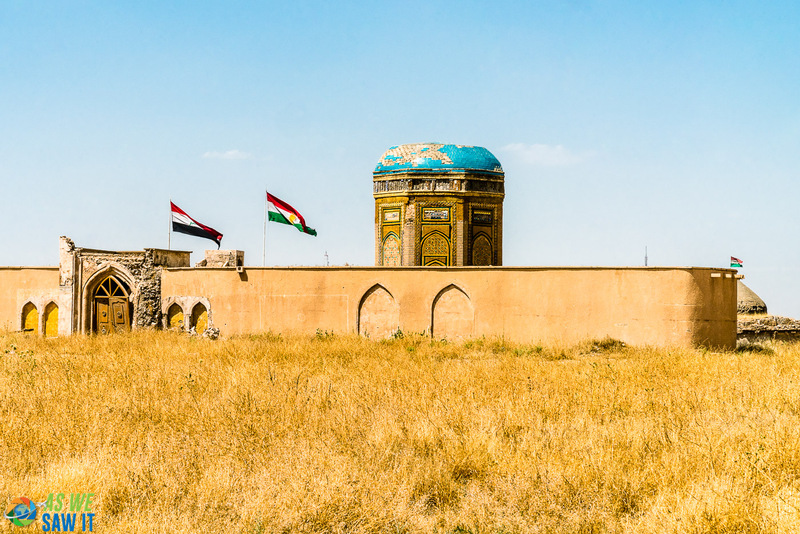 The modern-day city of Kirkuk sits on the ruins of ancient Kirkuk Citadel, from about 3,500 BC. After the fall of the Assyrian Empire, the city was shortly in the hands of Hammurabi of the Babylonian Empire. 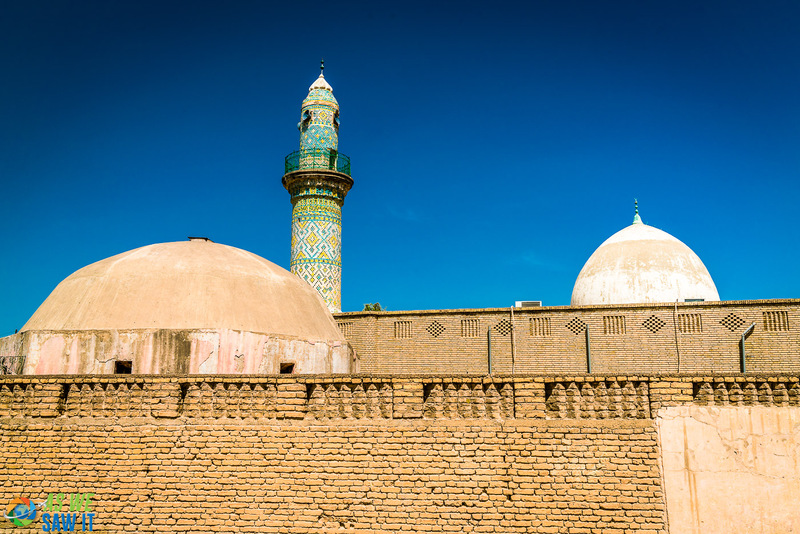 Today, Kirkuk has a vastly diverse population with an assortment of languages. Kurds, Turkmen, Arabs and Assyrians lay conflicting claims upon the city. Under Saddam, the population was skewed by flooding the city with relocated Arabs and the genocide actions against the Kurds. 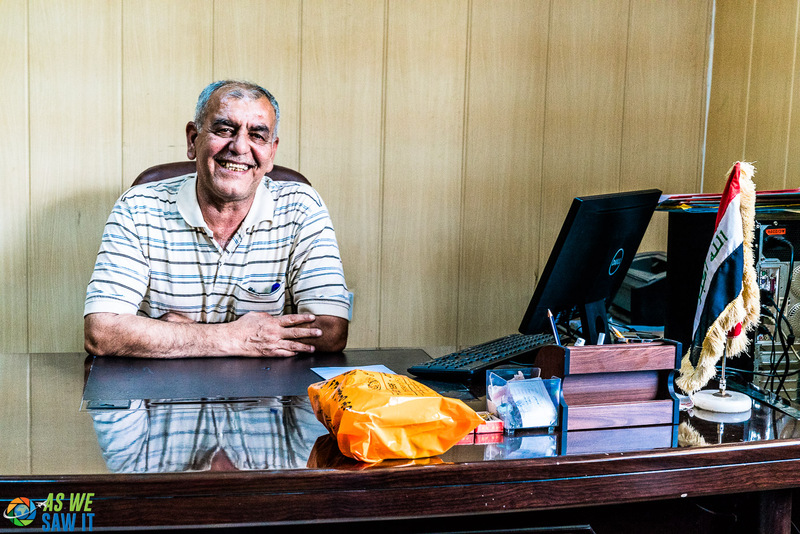 Karwan introduced us to Ayad Tariq Hussein, Minister of Antiquities for Kirkuk Governorate. He was such a sweet man, taking his precious time away from the desk to personally give us a tour of the Citadel of Kirkuk. 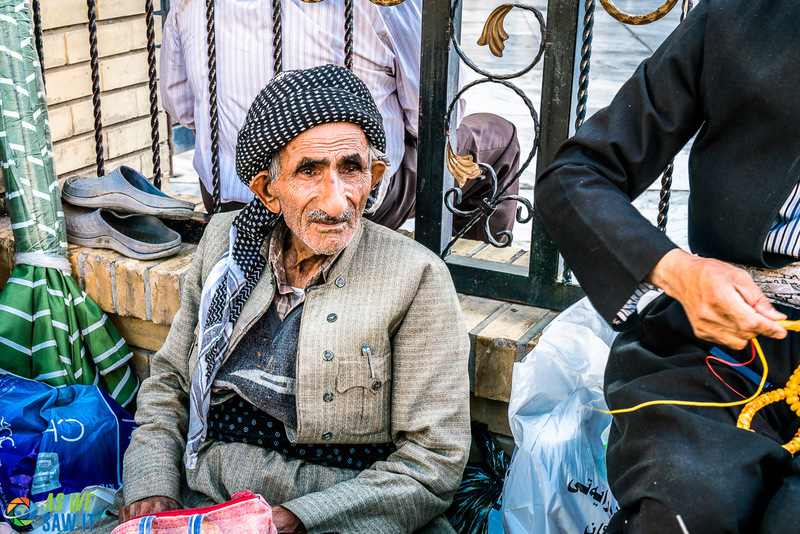 Your turn … is Iraqi Kurdistan what you expected? We’re so happy you enjoyed our story, Sara. We would really like to return and see the rest of Iraq, too. Hopefully, it won’t be long until it’s safe for tourists to visit. Wow! So much great stuff here! Who doesn’t want to visit the birth place of human history! Great job! Thanks, Eileen. We strongly believe it is a fatal mistake to blindly believe everything we are told. Far better to verify what we hear with firsthand experience, at least when it’s safe to do so. Kurdistan is an example.